Looking around a bright, carefully adorned SoHo apartment, you can see small diamonds floating in the air next to various products. If you focus on a diamond long enough, a text box pops up telling you more about its neighboring object. Flag Halyard Chair by Hans Wegner, $10,200. Lasvit Neverending Glory Palais Garnier, $2,560. If you tap on the side of your Samsung Gear VR virtual-reality headset while focusing on one of these products, the view in front of you goes black and a message “Added to your bag” appears. You might not be in the market for a $10,000 chair, but you might be interested in a new way to shop for one. This virtual shopping experience, a demo developed by digital marketer SapientNitro with luxury retailer The Line, was among a handful of VR demonstrations at the National Retail Federation’s Big Show. Ever wanted to shop for a $10,000 chair in virtual reality? Some day soon, you can. The retail trade association’s major annual conference, held this week at the Jacob K. Javits Convention Center in Manhattan, presented the latest tech and analytical tools for merchants. And while VR wasn’t front and center at the event, the demos show that people may eventually shop for groceries in virtual store aisles or visit a new mall from their living room. There’s been a fair bit of buzz around virtual reality, which has the ability to transport you to another world, but much of the talk has been around videogames and movies. The demonstrations at the NRF conference underscore the broader ways that virtual reality can change our lives, including how we might shop in the future. Yet, for now VR commerce, like much of the VR industry, is still small and experimental, with a big focus on getting people to get their first taste. Virgin Atlantic’s VR demo included smell-o-vision! Still, he added that VR will likely first work its way into in-store uses, where it’s easier to guide customers, and in the luxury market, where investing in more expensive tech like a VR headset makes more economic sense. 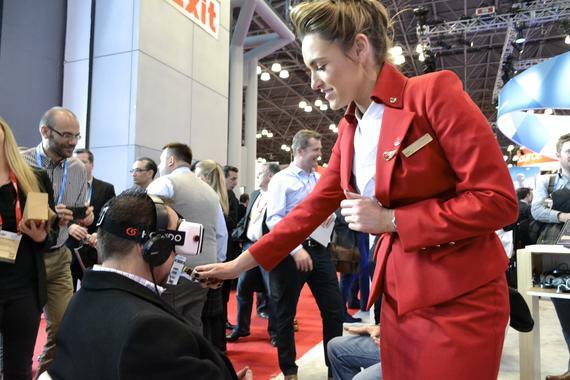 In one demonstration at Microsoft’s booth, Virgin Atlantic flight attendants helped fit viewers with Homido headsets and headphones to let them get a feel for the airline’s top-shelf Upper Class experience. A calm female voice guides the viewer through a visit to the airport lobby, a guided meditation and the view within the cabin. While someone watched the five-minute demo, a flight attendant would wave different scents under a viewer’s noses and a Microsoft Band bracelet would track a viewer’s heart rate. The demo isn’t for use with the general public and instead is utilized for wedding and travel shows to help Virgin Atlantic sales representatives present the experience with their airline in a fuller way than a brochure or YouTube video might. Fred Warren, a creative director for Microsoft who helped make the demo, said that because so few people have tried VR, he sought to craft the video to draw people into the experience slowly instead of surprise them. “It’s about building people up,” he said. 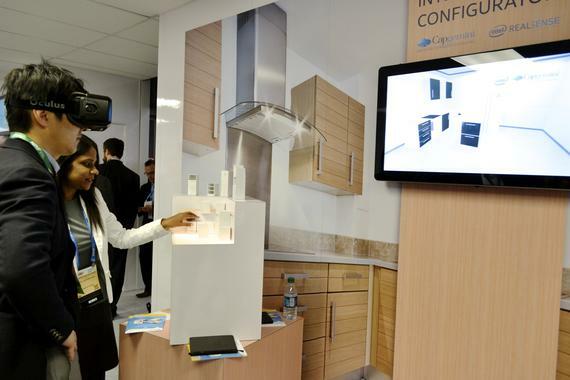 Using its RealSense 3D-sensing cameras, Intel showed off a kitchen remodeler created with Capgemini. The experience allows people to reconfigure their kitchens and change appliance models, finishes and colors, then put on a pair of VR goggles to see the end result. The concept isn’t being used in the public quite yet. One of the companies that’s already begun using VR in its stores is Lowe’s, whose VR technology was on display at this month’s CES tech show in Las Vegas. The home hardware retailer created a tablet app and website with the help of Marxent Labs, offering customers a grid to layout their homes and easily build their dream kitchen or bathroom using products Lowe’s sells in its stores. Lawnmower Man remodels his kitchen with the help of Intel and Capgemini. Once the room is complete, a shopper can put on a virtual-reality headset and is shown what the room would look like if she were standing in the middle. In front of her could be a kitchen island, with a vase and flowers. Look to the left, and there’s a sink; look to the right and there’s a door. So far, indications are customers don’t just enjoy this gee-whiz technology, they’re also more likely to buy products for their homes after seeing them in VR. Beck Besecker, Marxent’s CEO, said he sometimes calls the service “Minecraft for Moms.” But while most people know about that world-building game that’s become a hit with both kids and adults, VR is still something new to many.